An adult league game or two a week isn’t enough to keep our stick and skating skills sharp. Hit up a sticktime or adult hockey camp and work on your skills. You know the game is a lot more fun when you’re confident and not “thinking” out there. It’s midnight and there are no fans in the stands. Quit running around like you’re about to earn a tryout with a Southern Pro team. If someone clips you, get over it, you’re an adult. No one needs to show up to work tomorrow with a black eye or stitches. We’ve said it before, pay your share of the team registration fee ASAP. No one likes being the team banker let alone the collection agency. But also, team fee aside, fill the water bottles, bring pucks for warm up, and/or bring the post game beer. Be a proud contributing member of your team. You likely paid $100-$250 for your twig and you make an honest living. No sense in playing with an old sloppy tape job. Never settle for a sloppy tape job. Join the HPC! Whether that means finally using your gym membership, cutting back on your smoking habit, or taking a shift or two off, get it together. Most of us are far from useful to begin with, let alone when it sounds like we need an oxygen mask. Wash your jersey, socks, gitch, and anything else you can safely throw in your washer. Maybe throw an Odor Gladiator in your bag or use an equipment spray. Whatever, just do something to reduce that hockey stench. If you say you’re playing tonight, show up! It’s really that simple. We can all use the exercise. You know what gear and accessories you need to play tonight. 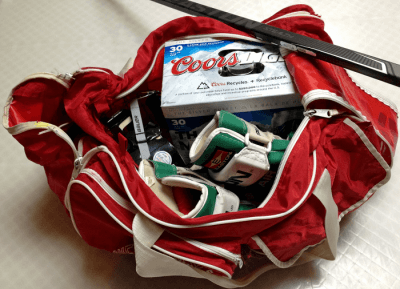 Before heading to the rink, take a minute to make sure you have all your equipment, tape, and beer [if it’s your turn of course]. Teammates that forget their gear or double as tape mooches are never appreciated. Remember when your coach would rip you a new one when you’d waste a perfectly good odd man break by shooting high-and-wide? Or when you didn’t take the pass away on a 2-on-1? Or how about steering that rebound to the corner instead of the front of the net? Regardless, you’re a wily vet who’s been around the game long enough to play smart. Do it. We understand it’s late but opportunities like this are few and far between anymore. Crack a cold one, reminisce and enjoy the room with your squad. Whether you’re telling old “war” stories or the team bachelor is filling everyone in on his sexcapades from the weekend before, you’re bound to have a few laughs. Carry your bag into the rink. It’ll help with those love handles you’re trying to shed!